History of Mesopotamia was characterized by numerous migrations, invasions and conquests of numerous peoples who were primarily attracted by the fertile land between Euphrates and Tigris. The first people who settled in Mesopotamia were the Sumerians whose origin remains unknown. Sumerians came to “the land between the rivers” in the 4th millennium BC, merged with the native population and established the first known cities in the world. The first known civilization - the Sumerian civilization emerged between 3100 BC and 3000 BC. The period from emergence of Sumerian civilization to about 2340 BC when the Akkadians overtook the control over Mesopotamia is commonly referred as the Old Sumerian Period and is divided on Pre-dynastic Period (3000 BC to 2800 BC) and Early Dynastic Period (2800 BC to 2340 BC). Little is known about the Pre-dynastic Period, sometimes called Jemdet Nasr Period (after archaeological site Jemdet Nasr north-east of Kish in today’s Iraq) but archaeological finds confirm the existence of highly developed urban civilization and that Sumerians were very skilled in the use of metals and had relatively high technological knowledge. Like ancient Egyptians, the Sumerians developed effective irrigation systems but in contrary to Egypt which was about 3000 BC united under a single authority - the pharaoh, Sumer consisted of numerous city-states among which were the most powerful Uruk, Ur, Kish, Eridu and Nippur ruled by priest-kings, by Sumerians called en, ensi or lugal. The Sumerians (probably the temple officials who were responsible for administration) invented writing - the cuneiform script even before the Pre-Dynastic Period about 3300 BC. Pre-Dynastic Period was followed by cultural decline until 2800 BC when Sumer entered the period of the Early Dynastic Period which was characterized by rebirth of the Sumerian civilization and the first list of rulers and ruling dynasties of Sumer - the Sumerian King List, a document which dates from the early 2nd millennium BC. For that reason some kings from the list are believed to be mythical. The first king of the Sumerian King List whose historical existance is confirmed is the 22nd King of the 1st Dynasty of Kish, Enmebaragesi (c. 2700BC or 2600 BC) who subdued Elam, ancient civilization east from Mesopotamia (today’s Iran). Enmebaragesi is also mentioned in the Epic of Gilgamesh as the father of Aga who laid siege to Uruk. The leading figure of the Epic of Gilgamesh, King of Uruk Gilgamesh who built the legendary walls of Uruk is also mentioned in the Sumerian King List. Mesilim, King of Kish (c. 2500 BC) is the first king of the Sumerian King List whose existence is confirmed by archaeologic finds. 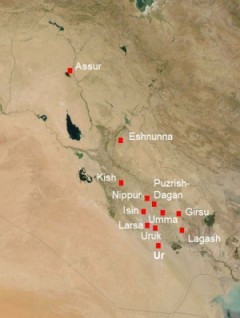 Chronology of Early Dynastic Period and the Sumerian King List are not completely reliable until 2340 BC although archaeological finds confirm existence of many city-states such as Ur, Uruk, Kish, Lagash, Umma and Mari which flourished at the same time and were the centers of political, religious, administrative and economic life. Literary works such the famous Epic of Gilgamesh (the oldest found script dating from about 2000 BC) also mention the early struggles between Sumerian city-states for overrule. Some of the Sumerian city-states managed to extend their influence over other cities from time to time until 2370 BC when Lugal-zage-si of Umma managed to establish his overrule over whole Sumer.